If your customer’s vehicle is being operated within Massachusetts, but is registered in another state or jurisdiction (county, city or province) that has a vehicle inspection requirement, the Massachusetts Department of Transportation (MassDOT) Registry of Motor Vehicles Division (RMV) requires you to inspect that vehicle so the motorist can provide his or her jurisdiction with proof of inspection compliance. Begin the inspection as you would for a vehicle registered in Massachusetts. Note: If the out-of-state vehicle registration has expired, you may still proceed with the inspection, unlike when inspecting vehicles with Massachusetts plates. When entering the vehicle-specific information, type the Vehicle Identification Number (VIN), then select the state where the vehicle is registered. Once a state other than Massachusetts is selected, the workstation software will skip over the license plate type field. Proceed as you would with the inspections that are appropriate for the vehicle. For light-duty passenger vehicles, the only exception in the safety inspection is that any type of window tinting is exempted from the Commonwealth’s window tint regulations. Provide the motorist with their Vehicle Inspection Report (VIR) and affix the windshield sticker to the vehicle as if it were registered in Massachusetts. Welcome! This page contains information about the different types of vehicles and the respective inspection requirements and guidelines. All commercial motor vehicles, trailers and converter dollies are subject to the Massachusetts Commercial Motor Vehicle Inspection. The Federal Motor Carrier Safety Administration (FMCSA) approved the Massachusetts Commercial Motor Vehicle Inspection as equivalent to the annual FMCSA or “DOT” inspection; therefore, if your commercial motor vehicle/trailer receives a state safety inspection, you are not required to obtain a separate FMCSA or “DOT” inspection. 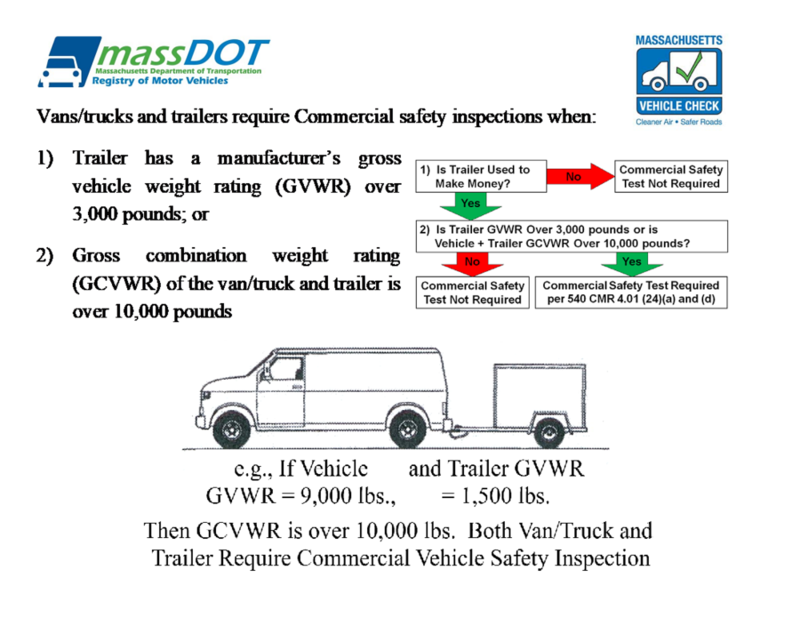 Massachusetts-registered single, full or semi-trailers used in commerce, that have a gross vehicle weight rating (GVWR) over 3,000 pounds or commercial motor vehicle/trailer combinations with a gross combined vehicle weight rating (GCVWR) of over 10,000 pounds are subject to this requirement, as are all heavy-duty motor vehicles (over 10,000 pounds GVWR) and converter dollies. The RMV created a one-page poster to help illustrate these commercial testing requirements. Trailers and converter dollies in use after January 1, 2009, must be in compliance with this new inspection. For more information, please see the document entitled “Information Concerning the New Massachusetts Commercial Motor Vehicle Inspection”. A motorcycle is any motor vehicle which has a seat or saddle for the rider, and is designed to travel with no more than three wheels contacting the ground. A bicycle with a motor or driving wheels attached is considered to be a “motorcycle” for inspection purposes. Motorcycles must receive yearly safety inspections from specially licensed motorcycle inspection stations. When a motorcycle passes the inspection, a sticker should be affixed to its license plate. Motorcycle inspection stickers are valid until May 31 of the following year. 7D Vehicles - A 7D vehicle is any vehicle registered with the Registry of Motor Vehicles as a school pupil transport vehicle pursuant to M. G. L. Chapter 90 Section 7D. They are usually passenger-type light-duty vehicles used to transport school pupils. In addition to their annual Massachusetts Vehicle Check inspections, these vehicles also receive special 7D inspections two times a year. Kit Cars - A kit car is a unique vehicle or a replica of any vehicle of which fewer than 500 are produced annually. Kit cars need to meet the air pollution control requirements of the U.S. Environmental Protection Agency (EPA) Kit Car Policy , or the alternative compliance requirements per DEP regulations, in order to qualify for a Massachusetts inspection sticker. These cars must receive an annual safety inspection, and newly registered kit cars must undergo visual inspections of their emissions control systems at a Motorist Assistance Center. Once they pass their emissions tests, they can return to their initial inspection stations to receive their stickers. Auto Homes - An Auto Home is defined as any motor vehicle originally designed or permanently altered and equipped for human habitation which is not used to transport property other than that property used for human habitation or camping purposes. These vehicles can be identified at inspection stations by the display of Auto Home (“Camper”) plates. Auto Homes undergo a non-commercial safety and emissions inspection regardless of the GVWR of the vehicle, and the inspection fee is fixed at $35. In other words, inspection stations are prohibited from charging an hourly shop rate even when inspecting Auto Homes. For Auto Homes with a GVWR less than 10,000 pounds, the inspection station must be a Class A, Class B or Class. For Auto Homes with a GVWR between 10,000 and 26,000 pounds, the inspection station must be a Class B, Class C or Class D. Additionally, the inspector must have successfully completed commercial training. For Auto Homes with a GVWR over 26,001 pounds or more, the inspection station must be a Class C, Class D or Class E. Additionally, the inspector must possess a commercial driver’s license (CDL) and have successfully completed commercial training. Recreational Vehicles - A recreational vehicle is any motor vehicle designed or modified for use over unimproved terrain, if used for recreation or pleasure off a public way. This term also includes all legally registered motor vehicles when used off a public way. Any motor vehicle registered under Chapter 90 will not be subject to registration under Chapter 90B, but must display a current motor vehicle registration.